My mom makes great apple pie. 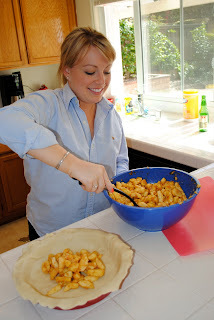 While, Legs and I were in San Diego last week, my mom decided to share her pie recipe with us. She had lots of fresh apples she gathered from my Grandpa's apple tree. She combined those (minus the skin, because I am allergic) with a small amount of sugar, cinnamon, and tapioca and poured them into store bought dough. Legs helped her peeled the apples and fill the pie while I watched in anticipation. Wow looks professionally done! Love it!